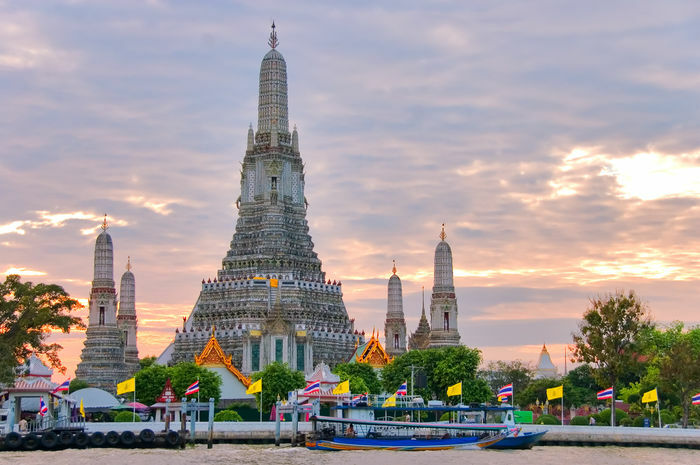 Bangkok, the capital of Thailand, is an important city of the country, but also one of the most polluted city of Thailand, that's why places to relax after a day of shopping or sightseeing are very important. Bangkok is the birthplace of the famous 'Thai Massage', it was created in one of the oldest temple of Bangkok, called Wat Pho. The temple hosts also a massage school and a traditional medicine school. The Thai massage help to improve the blood circulation and relieve all the body. Spas are part of the Thai culture, the country is promoting itself as the Spa capital of Asia, indeed the thai massage is famous all aroudn the world that's why it is a good way to attract tourist into the country. There are plenty of spas all around the city with almost the same offer, meaning the traditional Thai massage, Medical Spa. Massage costs around 30USD$ for the most basic one, and almost 90USD$ for the particular one in a luxury spa. Refuge to emperors and princes, poets and eccentrics, Capri retains its amorous spookiness. Boats moored off the coast of Capri, Italy. Capri, like many islands, has always colluded in its own secretiveness. The Villa Jovis of Tiberius, the most notorious pleasure palace of the Roman Empire, still stands at its eastern tip, and all over its cliffs of ilex stand the empty villas of the Belle Époque, when Capri was not only the gay capital of Europe but a sanctuary from an increasingly violent and industrialized continent. It was a place where eccentrics and wealthy fantasists could exorcize their demons. From Rilke to Norman Douglas, Axel Munthe to Henry James, Capri holds its fascinating charm and raw sexual appeal that tease the imagination like no other place has ever done. Lovers still come, armed with all their credit cards. Yet democratic tourism has also come to avenge the snobbery of the past. The Naples hydrofoils disgorge the day trippers wearing color-coded baseball caps and, around their necks, translation devices connected to their ears. They move slowly, in tribal groups, like medieval mendicants. Strangest are the Russians, anxiously headphoned, dressed in Black Sabbath T shirts and Crimean beachwear and led through the piazzetta by guides covered with buttons. Since they evince no joy whatsoever, no one knows why they are there. 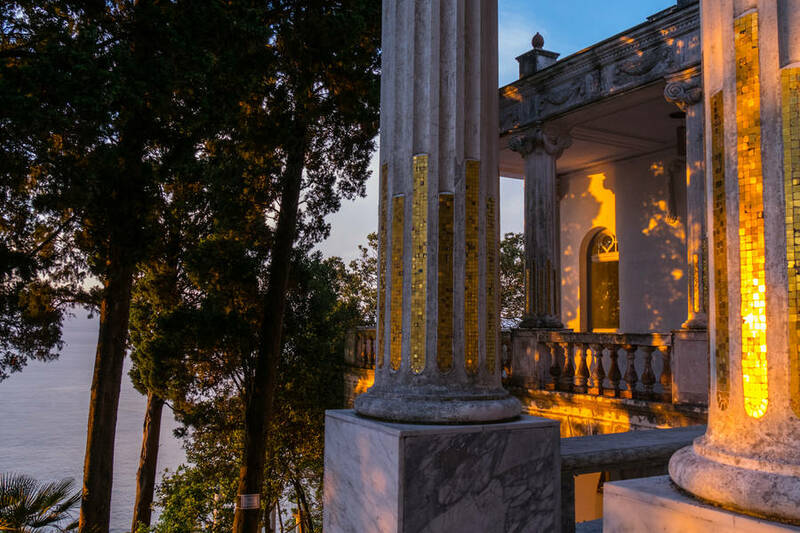 Fersen’s beautiful Villa Lysis still stands intact: its white columns encrusted with gold mosaics and its tiled opium den withstands the test of time. Ironically, Fersen also committed suicide on Capri, in 1923, by drinking champagne mixed with cocaine, and his house today is filled with photographs of his lover Nino Cesarini dressed as Pan. It was an affect, this paganism of the northern homosexual, but it had found at last a place that did not spurn it. Clambering along wild cliffs above the sea at dusk, lost in back paths bordered with flaking villas and orange trees, eating wild leeks and drinking Greco di Tufa wine... these are only some of the things you may enjoy as you bathe in Caprinian luxury. Much of Capri is pedestrianized, and the alleys carry earnestly quaint signs admonishing the ambulant rich to maintain values of “pulizia e silenzio”—cleanliness and silence—which is presumably what they want anyway. Why do places become the way they are? Capri was certainly shaped by the myth of Tiberius himself, an emperor who has always been misunderstood. His hostile biographer, Suetonius, invented the myth of an aging debauchee locked away on his favorite island and having himself serviced by girls and boys nicknamed “minnows” who would nibble between his legs as he took his daily swim. The Tiberian palace became a symbol of mad depravity, but modern scholars think it is more likely that the adopted son of Augustus lived a modest and abstemious life on Capri. No matter. We imagine the Tiberius we want to imagine, and the Tiberius of Capri is a monster created by a fusion of absolute power with inscrutable island solitude. The island seemed to have intoxicated the ruler of the known world, and the tourist hedonists of the early 20th century took up this theme deliberately. Meanwhile, its amorous spookiness prevails. On the remote paths between Jovis and Lysis, among the irises and fernlike wild asparagus, the land breathes a sexual heat and brightness. Enormous lemons grow in the sunken gardens, the white pillar houses set among strawberry trees like the villas of Minoan Crete. At night, on the path that skirts the sea toward the Arco Naturale, a deserted Roman cave shrine on the steps that lead up to the almost aerial restaurant at Le Grotelle. At the other end of the island, another place that keeps ahold of the past is the Caesar Augustus hotel in Anacapri. This former residence of a Russian prince, Emmanuel Bullack, sits on thousand-foot cliffs that look across to Vesuvius and Naples, just below the Villa San Michele. It’s one of those Italian cinque stelle -lusso—five-star luxe—hotels whose prime virtue is their unostentatious simplicity. From the balconies of the rooms one looks down at falcons, at the emerald shades of a sea that does not forget its centuries. In the beautiful restaurant run by Giuseppe Resta, on offer is Seppia linguine with conch and king crab and eggplant and fava and sweet mint from the hotel orto with a bottle of chilled Fiano de Avellino. The great urban restaurants don’t get near this level of soul. You can complain about what Capri has become—about the endless tableware stores, the yuppie underwear outlets, and the signs for “custom-made sandals”—but the nights still smell of sea and pine. The views in some unnerving way are already well known and memorized through news publications and shiny advertisements: the steep limestone cliffs crowded with umbrella pines and wild broom - and underneath, the limitless expanse of gemstone waters. Inevitably we will agree that Capri will forever be Capri. Adopted and Adapted from Newsweek. Situated on the Right Bank of the Seine, Le Marais stretches across the 3rd and 4th districts of Paris and is home to famous landmarks such as the Place des Vosges and the Picasso Museum. A hive of history and culture, it also offers a cutting-edge dining scene, with many fine dining establishments dotted around the area. Our culture lover’s guide explores ten must-try restaurants in the ever-trendy Le Marais. The term boutique hotel actually makes sense at the Hôtel du Petit Moulin (1) (29 rue de Poitou; 00 33 1 42 74 10 10; https://www.booking.com/hotel/fr/du-petit-moulin.en-gb.html?aid=327561), since the reception, still with its painted ceiling, was once a baker, frequented by Victor Hugo. It’s now the frontispiece to a small hotel, brilliantly decorated by Christian Lacroix. 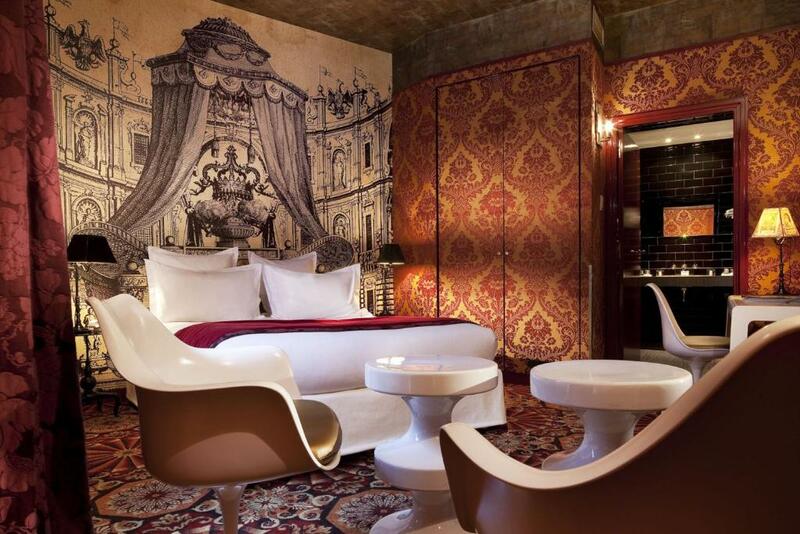 With just 17 rooms, it is intimate, full of luscious fabrics and patterns. Double rooms from €194, not including breakfast. Suffering from IKEA fatigue? Don’t panic, there is furniture made outside Sweden. Spread over nearly 350 square metres, Fleux offers a plethora of decorative and colourful design pieces. Opened in 2005, Luc Moulin’s and Gaétan Aucher’s boutique focuses on two key concepts: the superfluous and the luxurious. So rather than practical flat pack, expect to find anything from ceramic owls to green deer heads and paper lanterns. 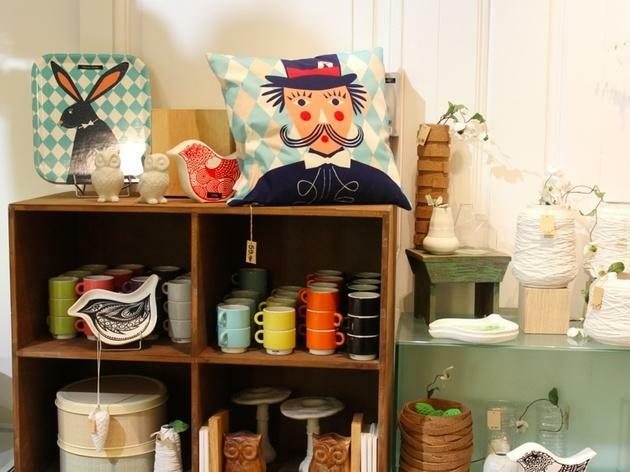 But it’s not all impractical gewgaws – even if the keyword here is derision, many pieces also serve a purpose, such as bird hooks (€15.50 for two), lamps in old jars and hand-shaped bookends (€24.90). Overlooking the Seine and the Ile Saint Louis, and facing the Saint-Gervais church, Chez Julien is an idyllic place to stop and soak up the historical atmosphere of Le Marais. A former bakery, the restaurant has retained its original features including an ornate tiled ceiling and glass panels on the façade. Candles and candelabras are infinitely reflected in the huge mirrors of the ground floor. Guests can either dine al fresco with the magnificent views or in the privacy of the cosy upstairs quarters. The menu promises flavoursome food including whole lobster salad in a mango dressing or a rack of lamb accompanied by couscous with dried fruits and fresh herbs.